Pretty Little Liars meets Ocean's 11 in this intrigue-filled contemporary drama from acclaimed author Kristen Simmons. What inspired you to write THE DECEIVERS? Norse Mythology, actually! (I know, so weird.) I’ve always been interested in the myths surrounding Valhalla and Ragnarok, the great battle at the end of the world. In the myth, the god of all gods, Odin, sends these tough warrior women (Valkyries) out into battles to gather the souls of dead soldiers and bring them back to his great hall in Valhalla, where they eat and train for the big showdown at the end of the world—Ragnarok. In my story, Brynn Hilder (in the myth, Odin’s lead Valkyrie is Brynhildr), is accepted into a school for con artists, where she is sent into the field by the school’s director, Dr. Odin, to gather political blackmail and bring it back for a final showdown against the corrupt officials of the city. Would you tell us a little more about your main characters? Brynn is tough and smart, and is looking for a way out of the neighborhood she feels trapped in. Trying to fight her way into a better life means running small cons to earn money for college, and when a spot opens up at an elite boarding school—Vale Hall—she’ll do whatever it takes to get in. The cover reminds me of Charlie’s Angels and the summary references Ocean’s 11… are there any similarities in the story? There are certainly a lot of cons, girls running heists, and some pretty big twists! At Vale Hall, they’ll even attend classes on how to tighten up their conning game! What was your favorite thing about writing THE DECEIVERS? The found family aspect for sure. I loved writing Brynn and her friends together, even more than I loved writing the plot twists. I hope readers especially love the scenes with Caleb and Brynn…those were some of my favorites! Did you do any interesting research for the book? Oh, a lot of con artist research! Contrary to popular belief, I’m not a natural hustler, so I had to learn about everything from the classics (the pigeon drop and the Tulsa bag scam for example), to insurance heists. I did some interviews with people who cannot be named who taught me a lot over very interesting things! Did you have any specific music you listened to as you wrote this story? Two songs stuck out big time for Brynn while I was writing—every time I heard them they got me in the right headspace. Body Talks by The Struts was one, and Whatever it Takes by Imagine Dragons, was the other. What is one of the books you’re reading now? I’m reading THE NIGHTINGALE by Kristin Hannah, which is fantastic, and totally out of my normal wheelhouse. It’s about two sisters in Nazi occupied France during WWII. It’s tense, heartbreaking, and beautifully written! What do you enjoy doing when you’re not writing or reading? Hanging with the fam and working it at JAZZERCISE! 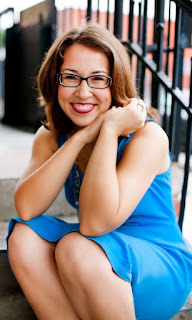 Thanks so much for having me on your blog! 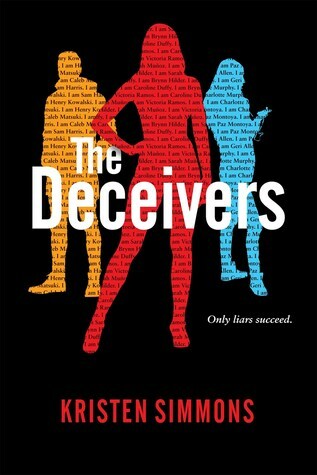 I hope your readers love THE DECEIVERS! THE DECEIVERS is a story that will keep you turning pages to the very end. Characters who are easy to connect with, a strong heroine, plenty of romantic and suspenseful tension, and a plot riddled with lies mixed with the truth make for an entertaining story from start to finish. Definitely recommended to YA contemporary fans who like some danger and suspense in their stories. Brynn was a brilliant character! I loved her with all her flaws and vulnerabilities. She's also smart in ways that many aren't because of her life experiences. I also adored Caleb. How could I not just completely fall in love with him? I appreciated how the author conveyed his struggles and the back and forth between him and Brynn. Lots of feels all over the place in this story as well. Then the suspense... there was a constant feel of danger and suspicion, of what secrets people were hiding and if all the players would remain unscathed in the end. On top of that there was some serious chemistry between Brynn and Caleb, so if you like your romance on the sizzling side, this one definitely delivers. In the end, was it what I wished for? This was quite a thrilling ride! A sizzling, but mostly sweet, romance and a plot that was intense from beginning to end is sure to keep readers on the edge of their seats and eagerly awaiting book two in the series. Content: Some violence, a few cases of mild swearing, mature content referenced (not detailed), some drinking and drug references, and some heavy and somewhat descriptive making out. 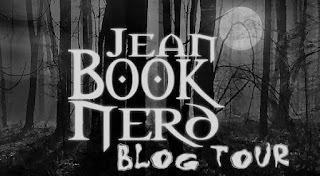 Source: I received a complimentary ARC from the publisher through JeanBookNerd Tours, which did not require a positive review nor affect it in any way. - 10 Winners will receive a Copy of THE DECEIVERS by Kristen Simmons.